An Overview of how the Lithium Ion battery works and how to use it to its maximum. These are not the Nickel Cadmium or NiCads your father used and they behave completely differently. Get him to read this too. Lithium Ion batteries are pervasive in any electronic device these days. They are in iPods, cell phone, laptops, digital cameras, video camcorders *and* all new cordless power tools (DeWalt, Ryobi, Porter Cable, Makita... all new cordless power tools). iPods use Lithium Ion batteries. The Video iPod uses an enhanced variant of the Lithium Ion known as Lithium Polymer. The reason Lithium Ion batteries are used is they have a great energy-to-weight ratio, and they create no direct memory effect (like nickel cadmium batteries have a tendency to). Beyond that, if they remain unused for a period of time they have a slow native drain rate also called "self-discharge" (5% per month) and will still have a charge left unused, over an extended period of time. If your iPod is here for any service, since the labor rate is $40 regardless of the number of things I do, it's worth considering that you replace the battery if it's 1 year old. It's not that after a year a battery won't hold a charge, but... each year the battery in an iPod looses about 40% of its ability to hold a charge so after 2 years it has a max of 36%. This is the math -->> 1 x .6 x .6 or 36% of its original capacity. In the 5th Generation video battery that means a max of 4 hours of music only or maybe an hour and 15 minutes of video play time down from 6 hours. Since the $40 labor charge is only paid once per iPod project, it's practical to think about this when it's here for other reasons. What usually happens is the iPod owner begins to notice they are merely getting a couple of hours from a charge and they notice how long they left it on the charger and do "multiple math". "I left it charging for four hours and got a 3 hour use of the battery, therefore if I charge it for twelve hours I will get 9 hours from the battery." In fact every moment you charge the battery past the 90 minute charge cycle, you are overcharging it and reducing the battery's capacity to store power by elevating the temperature and unbinding its chemistry. Lithium Ion batteries reach 100% of their charge capacity in just 90 minutes of charging. Over charging the Lithium Ion battery ruins the battery permanently and un-reverseably... a little at a time. The effects of over charging are 'cumulative' like UV exposure to skin. A little ruins it a little, a lot of overcharging damages it in a big way. You need to consider this if you use a car adapter/charger (think Belkin car adapter). This device charges (over-charges) the iPod the entire time its plugged in whether it needs charging or not. You also need to consider overcharging if you use something like "the Bose Docking Station" or "The iHome". These wall electrified amplifiers also continually over charge the battery. I think it's cheaper to change the battery if it's here and it's at least a year old rather than making it a separate/repair trip a year or so later. The draw back to using this battery type is that it is subject permanent capacity loss due to nothing but aging. Just left on a shelf unused a lithium ion battery will lose 6% of capacity to store electricity each year since it was manufactured. This capacity loss will occur even if the battery is unused. That type of loss is actually much worse in an iPod because the battery is held inside a small, packed, heat bound compartment. At 77° fahrenheit a Lithium Ion battery will lose between 30% and 40% of its ability to store electricity each year whether you use it or not. However if you leave the battery a little under half charged when not in use it will cut that permanent capacity loss by 60% to 8%, maybe 9%. The best thing you can do to extend the life of your Lithium battery is to not fully charge it. 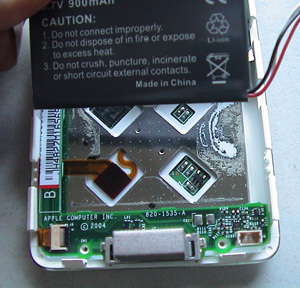 The worst thing you can do to a lithium ion battery is leave it connected to a charger, or connected to your computer charging in the iPod's case. If you are a laptop owner don't leave it connected to the wall charger, that shortens the battery life by at least 40% a year. You are basically cooking the chemistry out of the battery. Your cell phone and home cordless phone also rely on Lithium Ion batteries. Don't over charge them also. READ the Red and Blue lines above again. Lithium ion batteries can go into a state known as "deep discharge" when left unused for 2 or more years *OR* when they are recharged so often that they can no longer hold a charge. Actually they seem not to hold a charge. In fact when in 'deep discharge' through rapid cycling of charge/discharge, the battery can or will take 10 times as long to reach a full charge state. What would be a 'normal' 20 minute charge can take five hours. Your cell phone, iPod, home cordless phone, and Laptop all use Li-ion batteries. Do not fully charge them all the time and don't leave them on the charger all the time - it's a battery killer. But let's say you didn't know this before now..... and you've found your iPod battery not working like it used to. I sell and install replacements cheaply... and I dispose of the old Lithium Ion battery environmentally responsibly through a recycling program which gets the Lithium re-used again so it doesn't have to be mined as new in Brazil. These batteries are all factory new, recently manufactured and kept in a cool environment while here.